A misleading image macro claimed Chobani's CEO vowed to "drown the United States in Muslims" and was "importing them to Idaho 300 at a time to work in his factory." Chobani CEO Hamdi Ulukaya vowed to "drown the United States in Muslims" and is "importing them to Idaho 300 at a time to work in his factory." Chobani CEO Hamdi Ulukaya proposed big businesses step in and assist with a refugee crisis; Chobani has hired 600 refugees. Ulukaya did not vow to "drown" America in Muslim refugees; his proposal did not mention Muslims specifically; he has no legal ability to "import Muslims" at a rate of 300 per month. What would happen if they summoned the spirit of innovation and ingenuity to solve the greatest humanitarian crisis of our lives? What if — to borrow a word from Silicon Valley — we could “hack” the refugee crisis? That’s what I’m asking business leaders to do in Davos. As people of a free world, we have a moral obligation to the 60 million people who, like Nadia [a refugee from Kurdistan whose mother and brothers were massacred by ISIS], have been kidnapped or forced from their homes. People who need food, shelter, and opportunity, and have risked their lives to escape something that makes their childhood nightmares now seem like distant dreams. But it’s not just people who can help. Businesses — and the hundreds of thousands of people they represent — have a major role to play. At Chobani, the food company I founded in the United States, we have hired hundreds of refugees in the past five years, and they are some of the most talented, dedicated people I’ve ever met. Ever wonder why the federal government would be sending hundreds of foreign refugees to a relatively small town in Idaho? Wonder no more. They’re sent there, many of them, to work in the world’s largest yogurt factory. As WND previously reported, Twin Falls is in line to receive about 300 refugees this year, many of them Muslims from Syria. And the state of Idaho, despite its reputation as a mostly white, conservative farm state, has been a popular destination for refugees in recent years. The U.S. State Department has shipped more than 11,000 refugees directly from the Third World to Idaho since the Sept. 11, 2001, terrorist attacks. 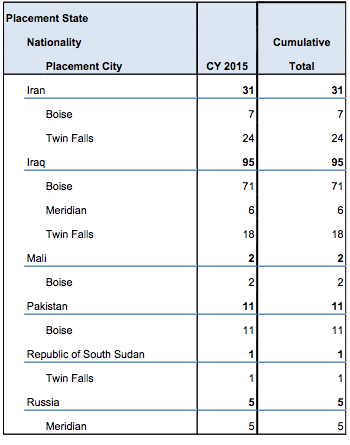 Just in the past year, 989 refugees have arrived in the rural state, most of them landing in either Boise or Twin Falls. Nearly half have come from some of the world’s nastiest jihadist hot zones, including 95 from Iraq, 94 from Somalia, 47 from Sudan, 39 from Afghanistan, 31 from Iran, 28 from Syria and 11 from Pakistan, according to the federal refugee database. But despite growing protests by local residents against the refugee arrivals, the Twin Falls area can count on being a prime spot for refugees for years to come, thanks to one man’s rising business enterprise … That man is Hamdi Ulukaya, a Kurdish Muslim and immigrant from Turkey who created the billion-dollar U.S.-based Chobani yogurt empire. WND collated a confusing number of metrics and purported statistics in their response to Ulukaya’s article, stating that Twin Falls would receive 300 refugees in 2016 (but not all of them Muslim or involved with Chobani), that 11,000 refugees from “the Third World” had entered Idaho as a whole since September 2001, and that 989 refugees from unspecified nations had arrived in Boise or Twin Falls in “the last year.” None of that mish-mash of numbers appeared directly related in any way to Chobani’s founder, or to his company’s hiring practices (especially given that the company wasn’t even founded until four years after the 9/11 terrorist attacks). 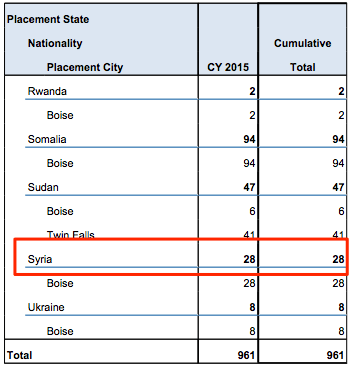 In 2015 a scant 28 Syrians (fewer than two percent of Idaho’s total) sought asylum in Idaho, despite intense focus on Syria’s refugees in the media. 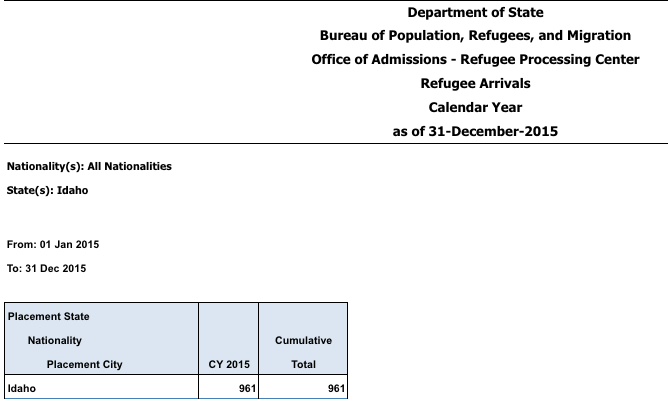 By contrast, 611 of the 961 refugees came from the Democratic Republic of Congo, Eritrea, Ethiopia, Somalia, Sudan, Burundi, and the Central African Republic (64 percent of all people settled in Idaho in 2015). Christianity (not Islam) was the primary religion in all but Somalia. Another 137 (14 percent) came from Burma (98) and Bhutan (39), countries that are primarily Buddhist. 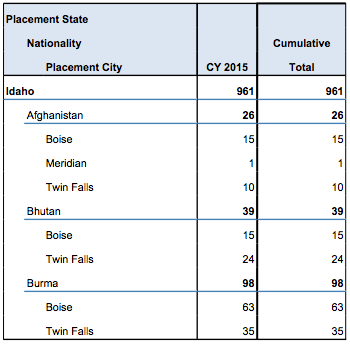 Removing the 9.7 percent from Somalia, the sum total of refugees from primarily Christian or Buddhist countries alone settling in Idaho in 2015 was 654 (or nearly 70 percent). Another two percent came from non-Muslim countries like Colombia, Russia, and Ukraine; despite the title of the piece, more than two-thirds of the refugees logged in the source material did not come from primarily Muslim countries. Boycott Chobani Yogurt, an American based yogurt manufacturing company in Idaho that is owned by a muslim who says he is going to drown the United States in Muslims and is importing them to Idaho 300 at a time to work in his factory. He is also giving them the jobs that should go to American families even though his American neighbors have protested his actions and oppose his behavior. Please do not buy Chobani Yogurt! As with many rumors of its type, the Chobani rumor evolved to encompass multiple versions inaccurately describing Ulukaya’s proposition, intent, and practices, including completely fabricated claims that Ulukaya had vowed to “flood” the U.S. with Muslims or “drown” the country in refugees. 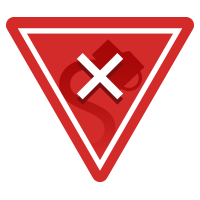 Some versions of the rumor asserted the CEO “imported” 300 Muslims per month” to the U.S. specifically to work in his Idaho plant, a claim which was difficult to square with immigration math. Per the U.S. Department of State, roughly 21,000 work visas were granted nationwide in each of fiscal years 2013, 2014, and 2015 [PDF]. If the claims about “300 Muslims per month” were to be believed 17% of all work visas were going to persons employed by a single yogurt plant in Idaho, irrespective of the fact that business people don’t have the authority to grant work visas of any description in the first place. Chobani, the yogurt company that grew from nothing five years ago to a roughly $1 billion powerhouse today, will formally open one of the world’s largest yogurt-processing plants in Twin Falls, Idaho. The $450 million, 1 million square-foot plant is the company’s second. It will employ 300 people, and Mr. Ulukaya said for every 10 jobs it creates directly, it is expected to create roughly 66 additional jobs in ancillary businesses. The claim that Chobani was headquartered in Idaho was also inaccurate. While the brand operates processing facilities in that state, Chobani was founded, and remains headquartered in, New York. It is true that Ulukaya proposed using business employment as a novel approach to a refugee crisis in January 2016. However, claims that he sought to assist only Muslim refugees and was personally “importing” 300 Muslims per month to work in his Idaho plant were fabrications. Ulukaya, Hamdi. Big Business Must ‘Hack’ Refugee Crisis.” CNNMoney. 20 January 2016. Hohmann, Leo. “American Yogurt Billionaire: ‘Hire More Muslim Refugees. '” WND. 20 January 2016. Tett, Gillian. “The Business Case for Helping Refugees.” Financial Times. 15 January 2016. Strom, Stephanie. “U.S. Hunger for Yogurt Leads to Gigantic Factory.” The New York Times. 16 December 2012. Pendleton, Devon. “Hidden Chobani Billionaire Emerges as Greek Yogurt Soars.” &nbsp Bloomberg Businessweek. 14 September 2012. Labs, Wayne. “Plant of the Year: Chobani.” FoodEngineering. 9 April 2013. Freedman, Dan. “NY Yogurt Industry, Including Chobani, Plays Its D.C. Cards.” Albany Times-Union. 4 July 2015. Abbott-Vlahos, Donna. “Greek Yogurt Maker Chobani Reduces Staff at Upstate New York Factory.” Albany Business Review. 6 June 2014.